Russian Prime Minister Vladimir Putin is set to face a series of questions about the economy when he takes part in a nationwide broadcast. 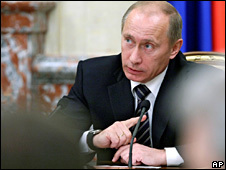 A Conversation with Vladimir Putin will be filmed at a studio near the Kremlin in front of a 400-strong audience. People from across Russia will be able to put questions to the ex-president. Last year, a million questions were submitted in advance, the Kremlin said. However, all were screened and none were considered overtly hostile to him. The BBC’s James Rodgers in Moscow says that perhaps the most significant thing about the “conversation” will not be the questions, but the person who is answering them. When Mr Putin was president, the broadcast became an annual tradition. Mr Putin left the Kremlin in May, after being obliged under the constitution to step down after two consecutive presidential terms. But it is he, not his successor, Dmitry Medvedev, who will take to the airwaves again this year, our correspondent says. Many will see that as a sign that it is Mr Putin, and not Mr Medvedev, who wields the real power in Russia, he adds. You are currently browsing the archives for the power behind the throne category.